In our new cabinet, we have about 3 large glass shelves, each 90 cm x 90 cm (35,43 inch x 35,43 inch), on each shelve we are going to put a diorama. The central theme of each diorama, will be “trains” … This tutorial is about the first of the 3 diorama’s, named “Crossroads”. The name “Crossroads” refer to the fact, that on this diorama, different type of “roads” cross eachother. 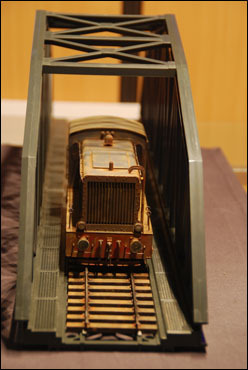 On “top” of the diorama, we will have an arched bridge, where a BR52 is passing on. Under this bridge, we will have a road crossing it, where an old VW beetle and a motor with sidecar will be put on. Also, passing this bridge underneath, and “parallel” to the road, will we a small river, with a rowboat and a fisherman in it. Front view, you can clearly see that the Trumpeter tracks fit nicely between the sides of the bridge. Sideview, this bridge is 90 cm long ! 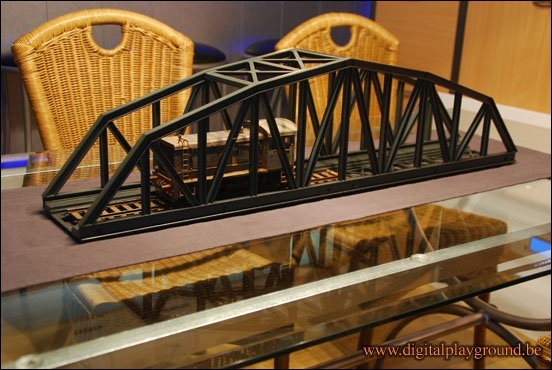 You are probably thinking, a 90 cm (35,43 inch) bridge on a 85 cm x 85 cm (33,46 inch x 33,46 inch) diorama ? Well, simple, the bridge/railway will be put “diagonally” on the diorama, which actually gives me about 120 cm (47,24 inch) tracklength !